Boring, milling, drilling, threading, and even prismatic-part creation are all possible if the boring mill is equipped with the proper accessories. Created by Fermat specifically for the manufacture of wind turbine hubs, these new tilting spindles enter the workpiece on an angle, a maneuver previously impossible on a horizontal boring mill. Creating large parts on a boring mill is a process that typically takes hours, but this does not mean that productivity improvement procedures, techniques, and technology cannot be utilized. Multitasking machining now can be done on some boring mills thanks to a number of options. Boring, milling, drilling, threading, and even prismatic-part creation are all possible if the boring mill is equipped with the proper accessories. Previously the only question typically asked before to purchasing a boring mill was the size and weight of the largest part that could be produced on the machine. Now, however, many more questions must be asked. Advances in CNC technology have affected every process in the manufacturing supply chain. More powerful processors have improved data flow, decreased processing times, and allowed larger programs to be created. The CNC controls all of the machine’s axes as well as the peripheral tools, such as a rotary table or milling head. Faster and more accurate axis movements mean that a part can be produced in less time than previously possible. Whether the part starts as a billet, casting, or forging, it is unacceptable to produce scrap when it is put on a boring mill. “When you have hours of machining time invested in a part, it’s vitally important that the part be finished correctly,” said Walker. Roller linear guideways enable faster movement and require less force to position the machine’s axes. This results in better positioning accuracy, while less energy is used. It’s not simply the machine and its components that affect overall accuracy. A proper shop floor foundation and possibly even a pit are necessary. “Having a good, solid foundation is probably the most important factor in maintaining accuracy over time,” said Walker. A trend in North American boring mill applications is the creation of large, complex parts that need to hold tighter tolerances. A rotary table can be used in these applications to machine on multiple sides of a part. “We are definitely seeing more demand for rotary tables in large-part machining,” said Walker. Rotary tables generally consist of a bed, slide, and a rotary clamping plate. The rotary table also is hydraulically clamped at multiple points to stop rotation during the machining process. In machine tool builder Fermat’s machines, the clamping plate is fitted onto a cross roller taper bearing, and a rotary encoder in the center of the table enables positioning in increments of 0.0001 degrees. While it is possible to switch out tables, this type of pallet-changing setup is uncommon. “I don’t predict that there will be a lot of unmanned operation in boring operations, partly due to the cost of the part. If there is a problem, like a crash, during an unmanned shift, it really could be a problem,” said Walker. Controlled by the CNC, automatic head changers (ATCs) are very common in today’s boring mills. “Having multiple heads that can be changed quickly allows different operations to be done on the part without the need to move it around the shop,” said Walker. Universal heads, right-angle heads, and fully articulating heads enable the boring mill to mill, ream, and thread, as well as create bores. New to the boring mill market is a tilting spindle. Created by Fermat specifically for the manufacture of wind turbine hubs, these new tilting spindles enter the workpiece on an angle, a maneuver previously impossible on a horizontal boring mill. A setup with three boring mills, called the Tricell, enables three-sided, simultaneous machining of a hub by one operator. The positioning of the tilting ram, combined with positioning of the rotary table, makes it possible to machine at different angles. This means that the machine doesn’t need to be equipped with angular heads to produce this type of work. Like any other machining process, cutting tools play a large role in the work done on a boring mill. Changes in cutting tool technology, such as new coatings, have enabled an increase in spindle speed because chips can be removed more quickly. And, while chip control is not easy with these big machines, it has gotten better recently. Smaller chips are being produced, which are easier to control. “Just by their nature and design, boring mills make it difficult to control chips,” said Walker. High-pressure, through-spindle coolant can be used, but it requires guarding to be placed around the machine that can be removed when not needed. Under the right circumstances, on-machine measurement can provide many benefits, including reduced scrap rates and rework. Probing and portable laser scanner systems that allow on-machine measurement actually can increase the boring mill’s utilization. “If you have to break down the setup and move the part around the shop to be checked, the machine sits idle during this measuring time,” said Walker. 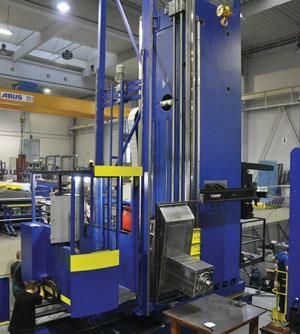 Measuring a part on the bed of the machine can reduce downtime and accuracy errors caused by handling the part. Possible errors can be corrected immediately on the machine. Many parts produced on a boring mill are just one piece of a much larger construct. Because of this, manufacturers cannot tolerate a lot of long-distance movement in their parts. That is one reason, according to Walker, that these large and heavy parts are not being created in other markets, but are made locally. While a boring mill is not necessarily a complicated machine, it is very large, and unique manufacturing challenges stem from the size. Design for manufacturability (DFM) is as important in the creation of a part on a boring mill as it is on any other piece of equipment. For more information, visit www.tosamerica.com.